In my opinion, gloves are great projects until you get to the fingers. Then they become tedious: casting on stitches, picking up stitches, breaking and reconnecting yarn, dealing with gaps. Puh. I'd cheat and make fingerless mitts, but then I'd have to deal with the fact that one big opening around the fingers can mean poorly fitting, gapping mitts which let in the cold. Again, puh. In a fit of focused and determined laziness (if there can be such a thing), I developed the Phalangee technique to create openings for fingers for fingerless mitts. 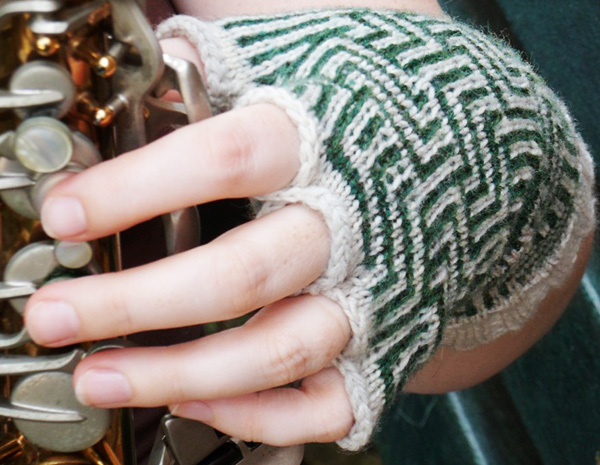 With a set up row, a connecting row and then an unusual bind off, previously gappy fingerless mitts can have finger openings without ever breaking the yarn. 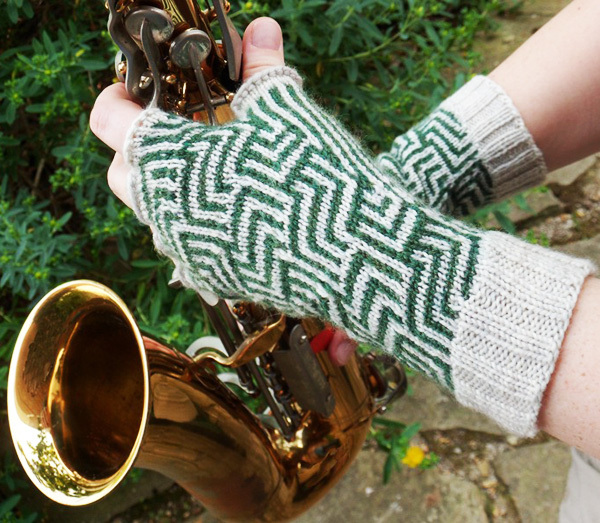 And, if gloves are preferred you can omit the bind off and work the stitches established in the connecting round without any fuss at all. The Phalangee technique can be used with any existing glove or mitt pattern. 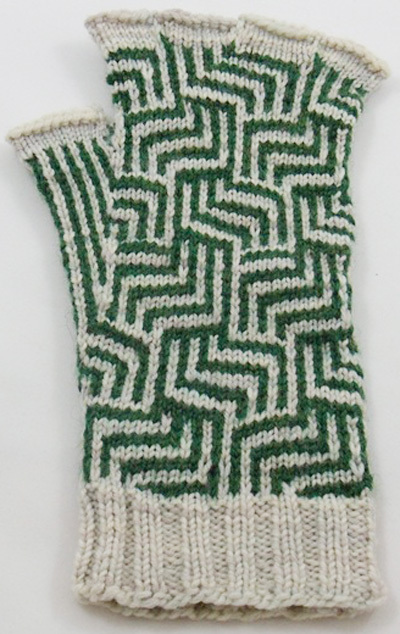 Alternatively you can use the design I've provided which features the Maze Mosaic pattern courtesy of Barbara G. Walker's Second Treasury of Knitting Patterns. Medium fits average woman's hand; Large fits average man's hand. [MC] Simply Socks Yarn Company [80% superwash wool, 20% nylon; 175 yds/160 m per 50g skein]; 827 Chocolate; 1 skein. [CC] Simply Socks Yarn Company [80% superwash wool, 20% nylon; 175 yds/160 m per 50g skein]; 325 Brick; 1 skein. [MC] Knit Picks Stroll Tonal [75% merino, 25% nylon; 462 yds/ 422 m per 100 g skein]; Pearlescent; 1 skein. [CC] Knitpicks Stroll Solids, Heathers and Twists [75% merino, 25% nylon; 231 yds/ 211 m per 50 g skein]; Forest Heather; 1 skein. [MC] Knit Picks Palette [100% Peruvian Highland Wool; 231 yds/ per 50 g ball]; Grizzly Heather; 1 skein. [CC] Knit Picks Palette [100% Peruvian Highland Wool; 231 yds/ per 50 g ball]; Oregon Coast Heather; 1 skein. With this new technique, the process of working individual thumbs and fingers for mittens and gloves is radically changed. The stitches that make up the sides of fingers that would normally be cast on (or picked up over cast on stitches) in a standard glove pattern are added as increases between the fingers. In the case of the thumb, these extra stitches replace the stitches that would be cast on/picked up over the palm-side opening in the hand. 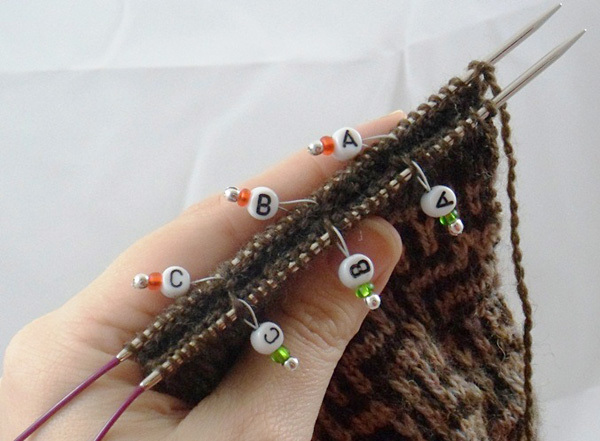 Once these new stitches are established, new mini-rounds for the thumb/fingers are created by connecting stitches across opposite sides of the work. These individual fingers/thumb rounds can then be worked in place leaving the rest of the round stitches live. The gloves should be worked on 1 or 2 circular needles - DPNs do not flex to permit the connections. 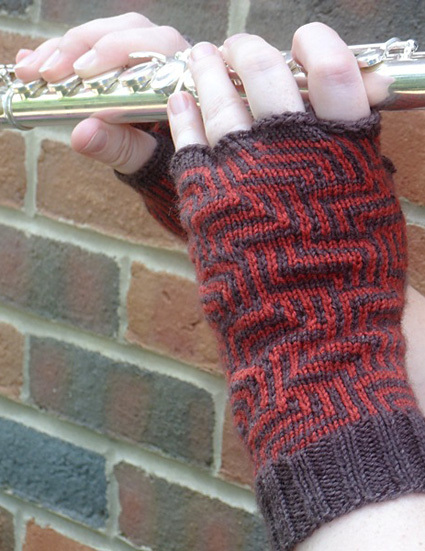 DPNs are used, however, for the figure-8 bind off of fingerless mitts. 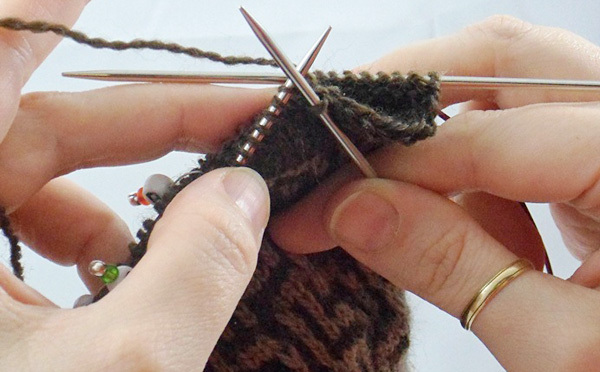 If you're adding individual fingers to a pattern that didn't previously have them, you will need to plan out in advance which stitches belong to which fingers. Divide the stitches into 8 equal (or nearly equal groups). Be sure both the front and back of each finger have the same number of stitches. As written in this pattern, the technique assumes that the rounds start at the pinkie. Obviously, not all glove patterns work this way. If the pattern rounds begin at the index finger adjust the directions accordingly. Instead of transferring thumb gusset stitches to waste yarn and dealing with them later, you can complete the thumb as soon as the gusset increases are complete. First, work an additional increase round adding four stitches - one on each side of both gusset markers. The stitches outside the markers will replace the stitches that would have been cast on to close up the palm round. The stitches within the markers will form the side of the thumb. Then a connecting round is worked. This round - which works together corresponding stitches on opposite sides of the round - will close up the thumb and separate the thumb stitches from the palm stitches. The thumb rounds will then be worked separately from the hand rounds. The connection is made by working together stitches on opposite sides of the work. No stitches are decreased, they are simply connected. 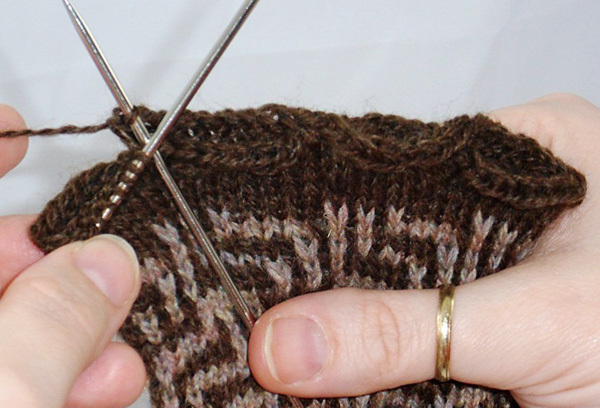 The thumb stitches - the original gusset stitches plus the two that came from the increases - are then worked in the round (on a separate set of double-pointed needles) and the thumb is completed as normal. This can all happen while the rest of the round is still "live", on the original circular needle(s). 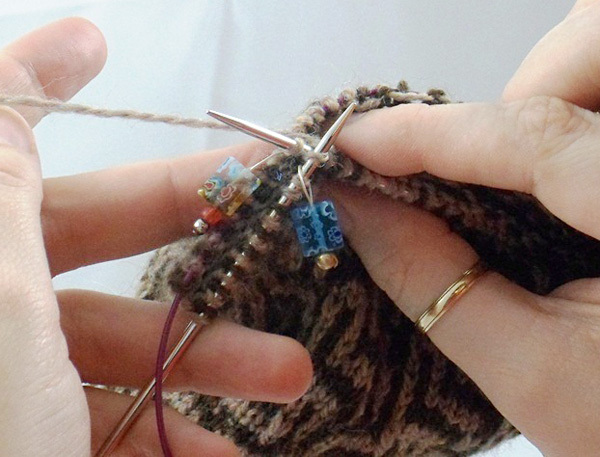 When the thumb is completed, break the yarn and rejoin it to the hand round already in progress at the base of the thumb, and continue working the hand. ...increases are worked to create the sides of the fingers; a round is worked to establish the new stitches; connections are worked to create mini-rounds; and, each mini-round is worked either into a full finger, or bound off (creatively) to create fingerless mitts. If working full gloves with complete fingers, each finger is worked separately with dpns while the remainder of the finger stitches are held on the circular needle(s). Break the yarn at the end of the finger and reattach at the base of the next finger. Since the side stitches are already established there are no gaps to fix. 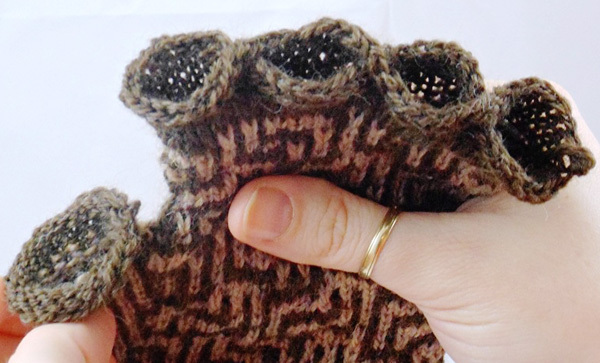 If working fingerless mitts, the fingers are bound off in one final round, working alternately across the fronts and backs of the fingers: across the front of the first, across the back of the second, across the front of the third, across the back of the fourth, and then turning around to close up the other halves of the fingers. This gives a great figure-8 path around the fingers. The stitches are bound off as presented: that is, the stitches viewed from the right side are bound off knitwise, stitches viewed from the wrong side are bound purlwise. During the bind off the stitches stay stationary on the circular(s), but a DPN or other spare needle is used for working the bind off. DPNS are used as stitch holders to keep stitches out of the way until it is their turn to be bound off. Twisted German Cast On video here. M1: Cast on 1 with a backwards loop. LLI (left lifted increase): Insert tip of left-hand needle from front to back under left leg of stitch below the last st knitted, now on the right-hand needle. Lift this loop onto left-hand needle and knit into the back of the loop. RLI (right lifted increase): Insert tip of left-hand needle from back to front under right leg of stitch below the first st on left-hand needle. Lift this loop onto left-hand needle and knit into the front of the loop. CS (Corresponding Stitches): The Corresponding Stitches are on opposite sides of the hand (or thumb) and are located immediately beside the markers - see illustration. They will form the sides of the fingers/thumb - and replace the stitches that are usually cast on/picked up between fingers in traditional glove patterns. For fingers the CS are the two stitches which will become the side of a given finger. For the thumb one set of CS - those positioned between the gusset markers - form the side of the thumb and the other - those positioned outside the gusset markers - become part of the hand. k-CS-tog (knit Corresponding Stitches together): Insert right needle into the front stitch then into the Corresponding Stitch on the opposite side (located to the right side of the stitch marker, purl bump is facing), wrap yarn, pull loop through both stitches and slip new stitch onto right needle. Because this is not a decrease stitch count remains the same. See illustration and tutorial photos. Work from written or charted instructions as preferred. Round 1: With MC, Knit. Rounds 2 and 3: With CC, k7, [sl1, k1] three times, sl1. Rounds 4 and 5: With MC, sl1, k7, [sl1, k1] three times. Rounds 6 and 7: With CC, k1, sl1, k7, [sl1, k1] two times, sl1. Rounds 10 and 11: With CC, [k1, sl1] two times, k7, sl1, k1, sl1. Rounds 12 and 13: With MC, [sl1, k1] two times, sl 1, k7, sl1, k1. Rounds 14 and 15: With CC, [k1, sl1] three times, k7, sl1. Rounds 18 and 19: Repeat Round 2. Rounds 20 and 21: With MC, k6, [sl1, k1] four times. Rounds 22 and 23: With CC, k5, [sl1, k1] four times, k1. Rounds 24 and 25: With MC, k4, [sl1, k1] four times, k2. Rounds 26 and 27: With CC, k3 [sl1, k1] four times, k3. Rounds 28 and 29: With MC, k2, [sl1, k1] four times, k4. Rounds 30 and 31: With CC, k1, [sl1, k1] four times, k5. Round 32 and 33: With MC, [sl1, k1] four times, k6. Repeat Rounds 2 to 33. Rounds 2 and 3: With CC, k5, [sl1, k1] two times, sl1. Rounds 4 and 5: With MC, sl1, k5, [sl1, k1] two times. Rounds 6 and 7: With CC, k1, sl1, k5, sl1, k1, sl1. Rounds 8 and 9: With MC, sl1, k1, sl1, k5, sl1, k1. Rounds 10 and 11: With CC, [k1, sl1] twice, k5, sl1. Rounds 12 and 13: With MC, [sl1, k1] two times, sl1, k5. Rounds 14 and 15: Repeat Round 2. Rounds 16 and 17: With MC, k4, [sl1, k1] three times. Rounds 18 and 19: With CC, k3, [sl1, k1] three times, k1. Rounds 20 and 21: With MC, k2, [sl1, k1] three times, k2. Rounds 22 and 23: With CC, k1 [sl1, k1] three times, k3. Rounds 24 and 25: With MC, [sl1, k1] three times, k4. Repeat Rounds 2 to 25. 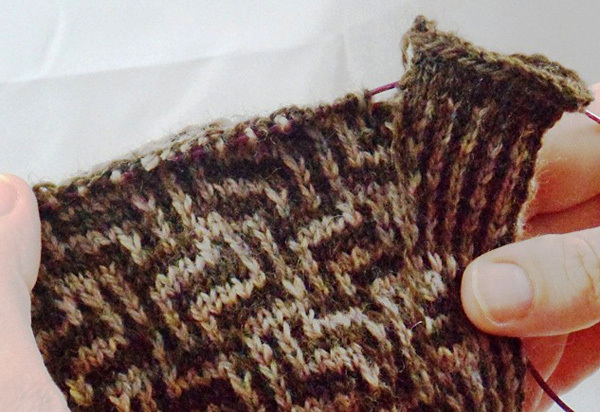 Using Twisted German Cast On (or stretchy cast on), MC and one or two circular needles (as preferred) cast on 56 sts. Join for working in the round. Ribbing round: K1, [p2, k2] to final st, k1. Ribbing round: [K3, p3] around. Repeat Ribbing round until work measures 1.5 inches. Using written directions or chart work first 15 rounds of appropriate size Maze Mosaic pattern. Note: Continue to work hand in Maze Mosaic as established alternating yarn colors every 2 rows; thumb gusset is worked in the round color. Round 1: Work 28 sts, pm; m1, pm; work to end of round. Round 2: Work to first marker; slip marker, k1; slip marker, work to end of round. Round 3: Work to first marker; slip marker, m1, sl 1, m1, slip marker, work to end of round. 2 sts increased. Round 4: Work to first marker; slip marker, k1, sl1, k1; slip marker, work to end of round. Rounds 5 and 6: Work to first marker; slip marker, sl1, k1, sl1; slip marker, work to end of round. Rounds 7 and 8: Rep Round 4. Round 9: Work to first marker; slip marker, m1, [sl1, k1] to 1 st before second marker, sl1, m1; work to end of round. Round 10: Work to first marker; slip marker, [k1, sl1] to 1 st before second marker, k1; slip marker, work to end of round. Rounds 11 and 12: Work to first marker; slip marker, [sl1, k1] to 1 st before second marker, sl1; slip marker, work to end of round. Rounds 13 and 14: Rep Round 10. Repeat Rounds 9 to 14 until there are 23 sts between gusset markers. Final color is CC final round is round 10 or 14. Round 1: With MC, work to first gusset marker, LLI, slip marker, RLI, work across gusset to second gusset marker, LLI, slip marker, RLI, work to end of round. The gusset markers mark the division between the thumb and the hand. 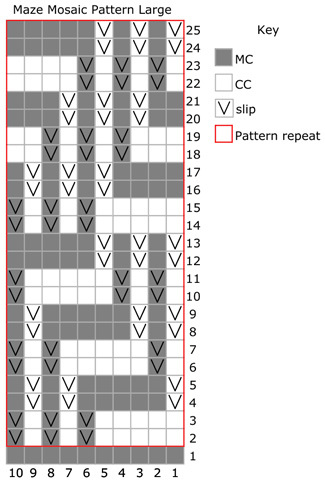 Using the pattern notes and tutorial photos determine which stitches are corresponding stitches. Round 2: With MC, work in pattern as set to 1 st before gusset marker, k2, work in pattern as set to 1 st before second gusset marker, k2, work to end of round. Round 3: With CC repeat Round 2. Round 4: With CC work in pattern as set to 1 st before gusset marker, k-CS-tog, sl1, work in pattern as set to 1 st before second gusset marker, k-CS-tog, sl1, work to end of round in established pattern. Round 5 part A: With MC work to gusset marker, using dpns k25 thumb gusset stitches. Join to work thumb sts in the round. Thumb rounds 1 and 3: Continuing with MC, k2tog, k to 2 sts from end of round, ssk. Thumb rounds 2 and 4: Knit. Bind off 21 thumb sts using Jeny's Surprisingly Stretchy Bind Off. Break yarn. Round 5 part B: With MC return to hand at the thumb, and complete the round in established pattern. Round 6: Work 27 sts in established pattern, ssk, k2tog, work 27 sts in established pattern to end of round. 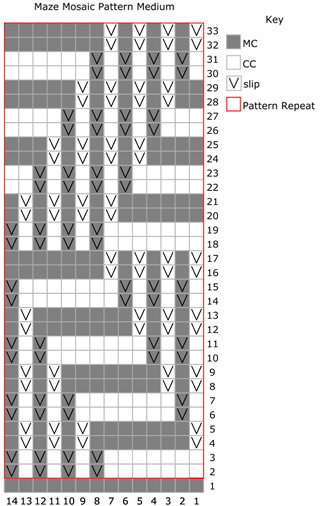 Continue with Maze pattern on hand sts until 3 complete reps of pattern have been worked, break CC. 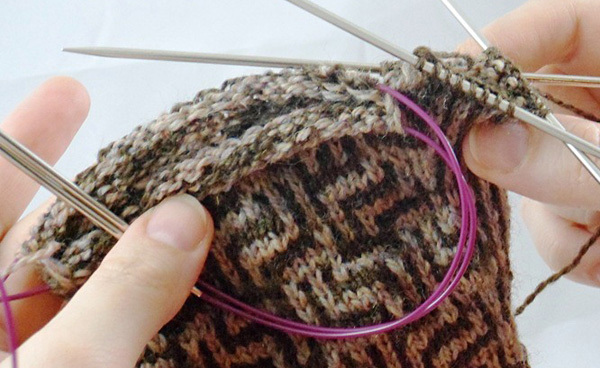 Using MC, knit 3 rounds or until mitt is desired length. Round 1: K7, LLI, pm (A1), RLI, k7, LLI, pm (B1), RLI, k7, LLI, pm (C1), RLI, k14, LLI, pm (C2), RLI, k7, LLI, pm (B2), RLI, k7, LLI, pm (A2), RLI, k7. Note: Markers A1 and A2 mark the division between the pinkie and ring fingers; B1 and B2 mark the division between the ring and middle fingers; and C1 and C2 mark the division between the middle and index fingers. The Corresponding Stitches are on opposite sides of the hand and are located on the same side of the markers. Round 3: K7, k-CS-tog, sl A1; sl 1, k7, k-CS-tog, sl B1; sl 1, k7, k-CS-tog, sl C1; sl1, k14, k-CS-tog, sl C2; sl1, k7, k-CS-tog, sl B2; sl1, k7, k-CS-tog, sl A1; sl1, k7. Note: the stitches slipped in this round are the sts that are "connected" from the other side. Knitwise from start of round to A1 (front of pinkie); purlwise between A2 and B2 (back of ring finger); knitwise between B1 and C1 (front of middle finger); purlwise between C2 and C1 (index finger from back to front); knitwise from C2 to B2 (back of middle finger); purlwise from B1 to A1 (front of ring finger); knitwise from A2 to end of round (back of pinkie). 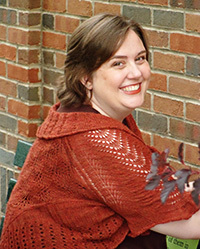 Jodie is profoundly grateful to the group of talented women who knit and laugh together at her public library. Their insight, camaraderie and support - not to mention their continual willingness to model and photograph for her - are simply tremendous. Thanks ladies...you're the best! More of Jodie's work can be found at QueenieKnits.com and on Ravelry.